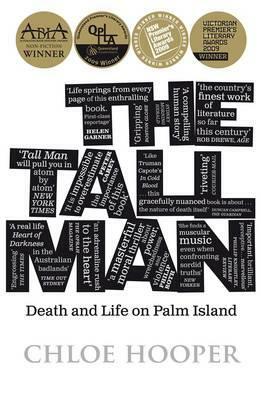 It is the story of that policeman, the tall, enigmatic Christopher Hurley, who chose to work in some of the toughest and wildest places in Australia, and of the struggle to bring him to trial. Above all, it is a story in luminous detail of two worlds clashing - and a haunting moral puzzle that no reader will forget. The pre-publication hype about this book is intense. It’s the first in a two-book deal rumoured to have paid $300,000; her first book since her debut novel A Child’s Book of True Crime made her a worldwide literary sensation; the book that began life as a series of magazine articles on Palm Island that won Hooper a Walkley in 2006. How does it live up to its great expectations? Perfectly well, thanks. From the first pages, it’s clear that you’re in the hands of an extraordinary writer, one who spins out perfectly observed sentences and intricate observations, in a manner eerily reminiscent of Helen Garner (who calls this book ‘enthralling’). One Gulf country town has ‘an edge of menace, as if it were always high noon’. A man’s face is ‘a rash of cancers’. Like Garner, or Truman Capote writing In Cold Blood, Hooper puts herself in the story; but she is only there in the margins, as a stand-in for us, the urban middle-class readers; our way into the story. Cameron Doomadgee was arrested for either swearing at a policeman on the street or singing a faintly insolent song, depending on who you believe. He was slung into the back of a police van by the ‘tall man’ of the title, Senior Sergeant Chris Hurley, the ‘boss man’ of Palm Island. The next day, he was found dead in his cell. This is the story of what happened next: the coronial inquest, the riot that rocketed the story to the nation’s front pages, the charging of Hurley for murder (making him the first police officer to be found responsible for a black death in custody), the trial. Hooper is there from the beginning as an ‘embedded’ observer, spending time with the Palm Island community. Here, she brings the complex looking glass world of the island to life – a world where time is irrelevant, where the ghosts of the past (victims of the stolen generations and the frontier wars) are omnipresent, and where dysfunction is normal. It is a place where heavy drinking and domestic violence are so much a part of the fabric of everyday experience that they are unremarkable. A place where, within living memory, Aboriginals were not allowed on the streets where the whites lived and had to ‘salute any white person they passed’. It’s also a place where Cameron’s sister Elizabeth looks after a flock of neglected children who pass in and out of her house, but is unable to save her own adolescent nephew, who succumbs to the weight of his suffering and commits suicide. The story of Cameron Doomadgee and Chris Hurley is a microcosm of the wider story of Australia. It is, at its heart, a story of the ongoing clashes between tribes in our country: the police and the Palm Islanders, white and black Australia, northern and southern Australia. It will make you angry, horrified, ashamed and sad. In a moving passage near the beginning, the dead man’s sister, Elizabeth, prays for Chloe’s ears ‘so that I would not miss any important details’. I would say that her prayer was answered. In a small town near Port Arthur in Tasmania in the mid-nineties, Kate Byrne is having an affair with the father of her most gifted student.